Coated concrete is commonly used as a building material and is arguably the most likely to experience coating failures. These failures greatly increase the potential for premature degradation of the substrate material and typically incur additional expenditure of resources to repair. In many cases, the lack of a comprehensive Quality Control Procedure is at the root of coating failures. As with other building materials, applying coatings to concrete requires specific measures to ensure coating performance and longevity. Assuming the concrete surface has been determined to be sound, that it is not compromised by contaminants such as dust, oil and grease, and that the moisture level in the concrete is suitable for painting, the following measures should be part of a quality control program for coating application. 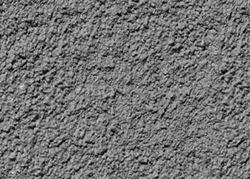 One of the first considerations in assuring coating quality control is the compatibility of the concrete’s physical surface texture (also known as the anchor or surface “profile”) with the coating to be applied. The recent ASTM standard D7682 “Standard Test Method for Replication and Measurement of Concrete Surface Profiles Using Replica Putty” references both Method A (visual comparison) and Method B (quantifiable measurement) as means by which to determine concrete surface profile. Given the possibility for coating failure and both preparation and materials costs, it may be desirable to have a permanent record of this profile for reference. One such test method that satisfies both the visual comparison and quantifiable measurement for surface profile utilizes a rapid cure, two-part putty. Through application and removal of the putty, a permanent relief mold of a surface sample is obtained. The relief mold may be visually compared to ICRI (International Concrete Repair Institute) CSP (concrete surface profile) coupons or measured with a specially-built micrometer at multiple areas on the mold in accordance with the testing method. 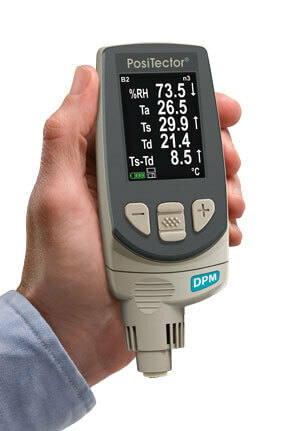 The primary reason for measuring climatic conditions is to avoid rework and the premature failure of protective coatings. Recommendations and requirements are covered under various internationally recognized standards in addition to those specified by the coating manufacturer.The ability to log results may also be important as evidence of the observation of these conditions before, during and after the coating process. The primary purpose for measuring coating thickness on concrete is to control coating costs while ensuring adequate protective coverage. 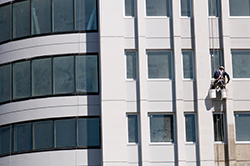 Commercial contracts often require an independent inspection of the work upon completion. Masonry coatings are used for a multitude of purposes including cosmetic appearance, durability, abrasion resistance, as well as protection from elements such as moisture, salt, chemical and ultra-violet light. Common coatings for concrete include latex paints, acrylics, lacquers, urethanes, epoxies, and polyester resins. 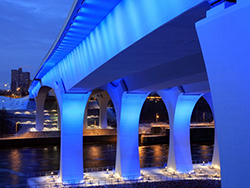 The St. Anthony Falls bridge (pictured) is coated with a uniform smooth coating to enhance multicolor LED lights at night and is finished off with an anti-graffiti clear coat. 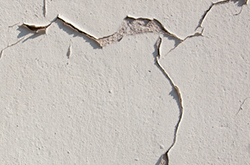 Traditionally, a destructive test method is used to determine coating thickness on masonry substrates such as concrete. Coatings used on concrete range from hard to soft, smooth to textured, and cover a wide thickness range. The surface of concrete can be quite rough, which can create significant variations in thickness measurements. ASTM D6132 “Standard Test Method for Nondestructive Measurement of Dry Film Thickness of Applied Organic Coatings Using an Ultrasonic Gage” details a non-destructive test method which eliminates the need to repair the coating after inspection, saving time for both the inspector and the contractor. Ultrasonic measurement testing equipment (PosiTector 200 pictured) operates by sending an ultrasonic vibration into a coating using a probe (i.e. a transducer) with the assistance of a couplant applied to the surface. Ultrasonic coating thickness gages are also utilized within the scope of SSPC-PA 9 “Measurement of Dry Coating Thickness on Cementitious Substrates Using Ultrasonic Gages”. The PA 9 method determines coating thickness by averaging a prescribed minimum number of acceptable (under the method) gage readings within separate spot measurement areas of a coated surface. Once the coating has been correctly applied to the required thickness, is it desirable to quantitatively measure the bond strength between the coating and concrete substrate. This testing method is detailed in ASTM D7234 “Standard Test Method for Pull-Off Adhesion Strength of Coatings on Concrete Using Portable Pull-Off Adhesion Testers”. Pull-off adhesion testing is a measure of the resistance of a coating to separation from a substrate when a perpendicular tensile force is applied. 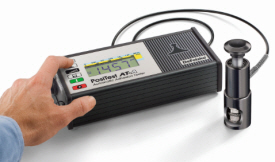 Portable pull-off adhesion testers (PosiTest AT Automatic & Manual models pictured) measure the force required to pull a specified diameter of coating away from its substrate. This measured pull-off force provides a direct indication of the strength of tensile adhesion between the coating and the substrate. By eliminating sources of pull-off variation, such as unintended bond failures between the adhesive and poorly prepared dollies, adhesion test results become even more meaningful and predictable. The major components of a pull-off adhesion tester are a pressure source, a pressure gage and an actuator. During operation, the flat face of a pull stub (dolly) is adhered to the coating to be evaluated. After allowing for the bonding adhesive to cure, a coupling connector from the actuator is attached to the dolly. By activating the pressure source, pressure is slowly increased to the actuator within the system. When testing on concrete, the pressure in the actuator typically exceeds the internal tensile strength of the concrete itself, at which point a cohesive failure occurs within the concrete. The maximum pressure indicator of the system’s pressure gauge provides a direct reading of the pressure at which the pull-off occurred. With proper cutting around the dolly, the instrument can be used to measure the tensile strength of uncoated concrete, as well as concrete repairs. As the use of concrete as a building material continues to grow, so too does the need to establish proper Quality Control measures when applying coatings. As outlined above, these measures ensure longevity of both the coating and the underlying structure and are a primary contributor to meeting cost and performance expectations.